The Brighouse Charity Jigsaw Puzzle Festival will return to town this month. This year, the event will be sponsored by independent jigsaw puzzle and board game company, Gibsons. The four-day event will be held at St Martin’s Parish Church from Friday, August 25 to Monday, August 28 and will showcase more than 1,000 different jigsaws, making the Brighouse Charity Jigsaw Festival the perfect place for serious puzzle fans and jigsaw newbies alike. First launched in 2012, the festival raises money for local charities. This year the beneficiaries will be Together for Looked-after Children, Water for Life and St Martin’s Children in the Community Charity. Funds are raised from the sale of jigsaw puzzles and crafts, a raffle, a tombola, a golden jigsaw competition and refreshments sold at the established “Missing Piece” café. Alan Sparks, lead organiser of the event, said: “The Charity Jigsaw Festival is now an established event in the local calendar with many visitors returning over the four days to view and buy from the constantly changing display. Entry for visitors is £2 and accompanied children can enter for free. 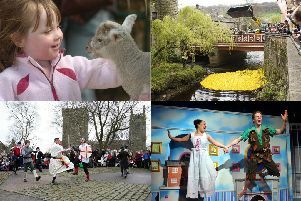 For more information on the festival, visit its website, www.charity.jigsaw.festival.brighouse.org.uk.